When I recently reviewed a 2-CD set of Munch conducting Saint-Saëns, Ibert, d�Indy, Franck, Roussel and Honegger I outlined the career of this remarkable conductor and suggested that he may have been the ideal interpreter of that part of the French repertoire which leans towards the German symphonic tradition. By implication, it might be expected that his no-holds-barred verve and gut conviction might be a bit over the top for Debussy. 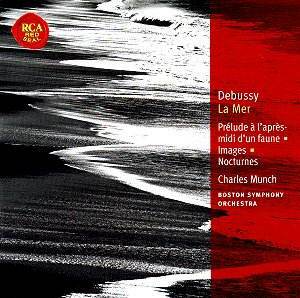 The question is, did Debussy really live in a world of vague impressions, shadows and dreams? Munch evidently didn�t think so and he convincingly gives us a Debussy of flesh and blood, a creature of passions, a composer who sings and exalts. His Prélude à l�après-midi d�un faune climaxes with great banks of string tone which might be thought not excessive even in Rachmaninov, yet the voice which speaks to us is still Debussy�s � it�s question of timing and of nuance. The abiding impression of his La Mer is one of colossal power. The Jeux de vagues second movement is quite extraordinary for the way Munch seems to draw phrases out from the depths of the orchestra, then, as the phrase reaches its apex, lo and behold another is welling out from the other side of the spectrum. This also says much for the effective use of early stereo. When these recordings were new their vitality was always recognised, but it was sometimes felt that the finer poetic nuances were lacking. This is now shown to have been largely the result of the rather strident sound RCA favoured in those days. In spite of a rather high tape-hiss these recordings now sound incredibly good for their age � dates are not given but I presume this is the 1956 version of La Mer which has already appeared on CD at least once. The two Nocturnes and the Prélude are slightly later and first appeared in the UK in 1963. In a piece like Nuages we can note that Munch certainly expects us to hear every note � no vague groping around in the far recesses of the orchestra � but we can also appreciate the expressive intensity and pinpoint nuance the players show even while playing pianissimo. Or listen to the trumpet near the beginning of Gigues before the faster music bursts in. This is a truly great orchestra under a conductor who knew how to get the best out of it, make no mistake about it. I can see that the Munch recipe might have come adrift with lesser orchestras (it would be interesting to hear for comparison the version of La Mer he made for Concert Hall with the French National Radio Orchestra), and it would be a dangerous model to emulate, but that only adds to the uniqueness of what we have here; a particular combination of orchestra and conductor with a sound and a style all of their own. Though from a critic�s point of view this is a "historical recording", I should add that the sound is still remarkably vivid and so this also makes a superb introduction for the first-time buyer to Debussy�s major orchestral masterpieces. It may even provide a point of entry to those unable to relate to the softer-centred impressionist Debussy more commonly heard. There are good notes on the music and a brief paragraph on the conductor in three languages.